At McNeil Industrial, we offer first-in-class industrial refrigeration services throughout North America. Through the application of our extensive knowledge and experience our design and installation capabilities have the industry standard. We have the capabilities to provide you with the type of results that will fill all of your ammonia refrigeration system requirements. It is always our goal to ensure your end product is high performing, reliable, and cost-effective. The designs we implement have been developed to produce reliable and efficient refrigeration system operations that minimize maintenance requirements. Our team extensively evaluates these systems to pinpoint specific opportunities for reducing costs while also making sure system performance has not been compromised. Regarding the industrial refrigeration services we provide, we work thoroughly to fulfill each customers specific requirements. Our team of professionals is dedicated to ensuring you have a refrigeration system that functions efficiently for the long term. We also search for avenues within the design and installation process to help you achieve optimum ammonia cooling system results. If you are ready to make a new capital investment, or update to your current industrial refrigeration system to provide a greater level of operational efficiency, we can help. We have the know-how, resources, and experience to help you achieve a cost-efficient system. At McNeil Industrial, exceptionally economical and low maintenance industrial ammonia cooling systems are what we provide our customers on a consistent basis. These systems are utilized in a range of different industrial applications and environments. 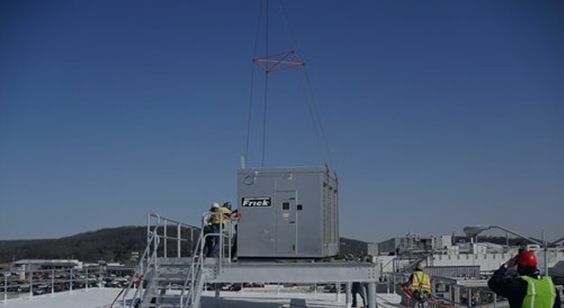 Over the years, our team has completed a number of industrial refrigeration system projects for customers. We have a strong track record and can take on a wide-range of industrial refrigeration design installation projects. We implement cost-efficient solutions utilizing innovative technology and proven practices to fulfill your refrigeration system requirements. For information about the industrial refrigeration services we offer at McNeil Industrial and how our team can serve your specific ammonia refrigeration needs, give us a call today at 800.728.6160 or send us a message through our contact form.